Pictured are Elks Past Exalted Ruler and scholarship committee member Ed Helt, scholarship winners Victoria Fliehman, Dylan Page, Spencer Minyo, and scholarship chairman Matt Barga. 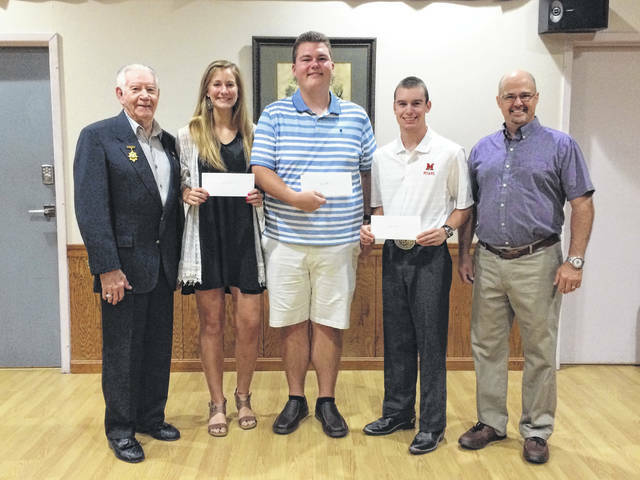 The Washington Elks Lodge #129 recently presented the local Most Valuable Student scholarship winners from the class of 2018 with their checks. This year’s scholarship winners were Victoria Fliehman, who is attending Cedarville University; Dylan Page, attending Ohio State University; and Spencer Minyo, attending Miami University. Pictured above are: Past Exalted Ruler and scholarship committee member Ed Helt, scholarship winners Victoria Fliehman, Dylan Page, Spencer Minyo, and scholarship chairman Matt Barga. Victoria will be attending Cedarville University, Dylan will attend The Ohio State University, and Spencer will attend Miami University. The National Elks Foundation provides more than $3.64 million in college scholarships each year through its three scholarship programs: Most Valuable Student, Legacy Awards, and Emergency Educational Grants. The application process and deadlines vary for each program. All applications must go through a local Elks Lodge before reaching the Elks National Foundation office. Contact your high school counselor for more information or your local Elks Lodge. Additional information on these scholarship programs can be found at www.elks.org and clicking the scholarship link. https://www.recordherald.com/wp-content/uploads/sites/27/2018/08/web1_Elks.jpegPictured are Elks Past Exalted Ruler and scholarship committee member Ed Helt, scholarship winners Victoria Fliehman, Dylan Page, Spencer Minyo, and scholarship chairman Matt Barga.